(ENG) Hi there! Here's a creature design I did recently. The idea was to create in a semi-cartonny style, a monster that was sort to speak, an unescapable predator: strong, quick and very unpredictable. I thought it'd be interesting to base it on a fly, since I picture the creature doing small rapid movements all the time as well as being able to jump/fly big distances in a blink of an eye. I tried to build it's anatomy in a way that it would always seem to be anticipating for attack, hence adding to the menacing look. Also, I gave it huge eyes (to imply that nothing escapes to them) yet inexpressive ones: I find that when a creatures' eyes are totally inexpressive or even better, there are no eyes at all, the creature automatically becomes a lot more threatening and scary, since it's impossible to tell what is going through it's mind. Additionally, it impedes communication the way we as humans are used to, and hence, reasoning with the creature ceases to be an option. The Alien monster, by H.R. Giger is a great example of all this (and possibly the best monster design ever done). I wouldn't wanna bore anyone but there is really a lot interesting stuff that you can think about when designing any creature or character. However, none of this thinking is useful if it stays in the pencil and never trascends to the final design... but this is something not for me to judge. 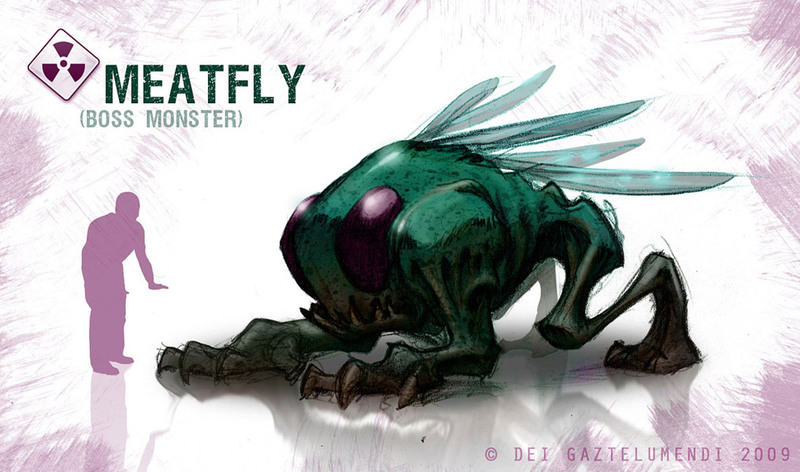 Hence, I'd love to listen to your thoughts about the MEATFLY or creature design in general. Thank you. (EUS) Ieup! Duela gutxi diseinaturko izaki bat jartzen dizuet hemen. Ideia, nolabait esatearren, ihesezinezko arrapakari bat sortzea zen erdi-cartoon estilo batean: indartsua, azkarra eta ezustekoa. Interesgarria iruditu zitzaidan euli arruntean oinarritzea, izakia mugimendu azkar eta txikiak egiten irudikatzen bianuen eta baita bapatean distantzi handietan zehar mugitzen ere. Marrazten nuen bitartean, bere anatomia modu zehatz batean ezartzen sahiatu nintzen denbora guztian erasotzeko prest dagoelaren itsura eman zezan. Begiei dagokienez, haundiak (ezerk ihes egiten ez diela sentiarazi nahiean) eta espresiogabeak egin nituen: iruditzen zait munstro baten begiak guztiz espresiogabeak direnena, edo are gehiago, begirik ez duenean, segituan askoz ere mehatsagarriagoa bilakatzen dela, ez baitago esaterik zer pentsatzen hari den. Gainera, honek komunikazioa eragozten du gizakiok ohituta gauden moduan, eta beraz, ez dago piztiarekin jan ez gaitzan eztabaidatzerik. H.R. Giger-en Alien munstroa guzti honen adibide bikaina da (eta ziurrenik inoiz sorturiko munstro diseinurik hoberena ere). Ez dut guzti honekin inor aspertu nahi, bahina gauza interesgarri asko daude benetan edozein izaki edo pertsonai diseinatzerakoan kontutan hartzeko. Hala ere, txapa guzti honek ez du ezertarako balio pentsamentu hauek arkatzean geratzen badira diseinu finalera iritsi gabe... baina hori ez da nik epaitu dezakedan zerbait. Horregatik eta beti bezala, asko gustatuko litzidake edozein ideia edo iritzi jasotzea, bai MEATFLY-ri buruz edo besterik gabe diseinu kontzeptualaren inguruan. Eskerrik asko. (ESP) Hola! Aquí os pongo una criatura que he diseñado recientemente. La idea era la de crear en un estilo semi-cartoon un monstruo que fuera, por decirlo de alguna manera, un depredador del que es imposible escapar: fuerte, rápido e impredecible. Me pareció interesante basarme en la mosca común, ya que me imaginaba a la criatura haciendo movimientos cortos y rápidos todo el rato, al igual que siendo capaz de desplazarse grandes distancias en un abrir y cerrar de ojos. Mientras dibujaba, intente disponer la anatomía de la criatura de manera que siempre pareciera estar preparándose para atacar, lo cual intensifica el aspecto amenazante. En cuanto a los ojos, los hice enormes (nada se les escapa) pero inexpresivos: pienso que cuando los ojos de un monstruo son totalmente inexpresivos, o aun mejor, no tiene ojos, este se vuelve automáticamente mucho mas amenazante y terrorífico, ya que no hay manera de saber que es lo que esta pensando. Ademas, esto impide la comunicación tal y como los humanos estamos acostumbrados, y por lo tanto razonar con el monstruo deja de ser una opción. El monstruo de Alien, por H.R. Giger, es un gran ejemplo de todo esto (y posiblemente el mejor diseño de monstruo jamas creado). No quisiera aburrir a nadie con todo esto, pero la verdad es que hay mogollón de cosas interesantes en las que pensar a la hora de diseñar cualquier criatura o personaje. Por supuesto, toda esta chachara no sirve para nada si todos eso pensamientos se quedan en el lápiz y no transcienden al diseño final... pero eso es algo que no me corresponde a mi juzgar. Por ello, y como siempre, me encantaría recibir cualquier comentario o critica, sobre MEATFLY o sobre diseño conceptual en general. Gracias. inexpression is a powerful tool for menace, yet, that depends on one, the creature's confidence and two, if it's sill capable of expression with the rest of it's body. but your right, if instead of the eyes you gave it, you instead gave it eye brows and angry pupils, the creature would become a definable presence whereas now, it's a variable, and fear of the unknown outweighs fear of the known. the creepiest killers are the vague ones that wear masks and move slowly with no emotion, they out shine the Freddy kreugars that we can read like an open book. I couldn't agree more. what we don't understand, know or see it's what scares us the most. Characters with readable but constant expressions are quite scary too.. but then again, a constant expression is the same as a mask. Thanks for sharing your thoughts King.